If you’re like me, this Brewers seasons has frustrated you to no end and you’re probably having a difficult time coming up with positive things to say about the team. At this point, the only non-negative things you can think of to say are laced with sarcasm. Or perhaps now you’re just content that no other players have been injured within the last week. That’s a good start…I think? Segura has been fun to watch, and Gomez has been a nice surprise, but other than that, this season has pretty much been a nightmare. Sure, the Brewers just won a series in Miami and are coming off a 6-0 win against the division rival Reds yesterday, but for the most part, there haven’t been a whole lot of positives this season. For me, I’d much rather think about the future of this franchise than dwell on their ho-hum play from 2013. 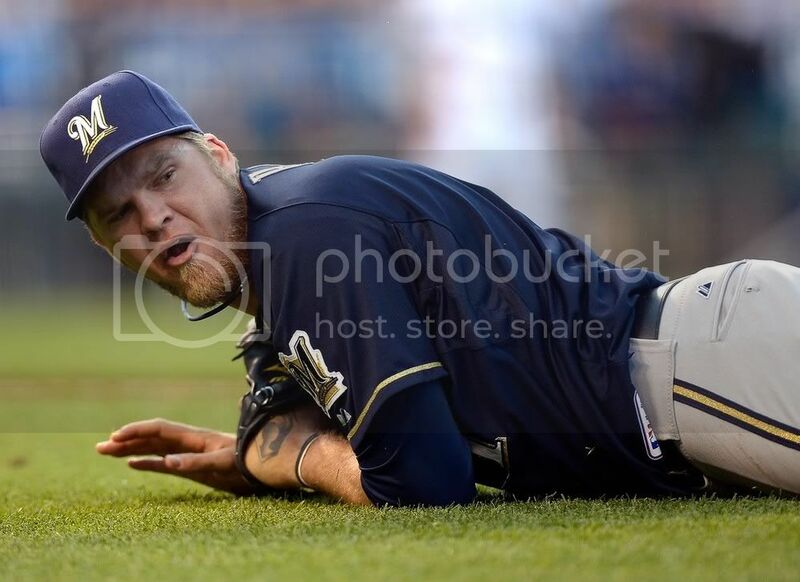 Corey Hart trips on blade of grass, placed on 365 Day DL. Let’s look forward to 2014 and see how next season could possibly start out. The players that the Brewers could and should end up moving this year are third baseman Aramis Ramirez, right fielder Nori Aoki, bullpen pitchers Francisco Rodriguez, Michael Gonzalez and possibly John Axford and Jim Henderson. The Brewers should also look to see what they could get in return for starting pitchers Kyle Lohse and possibly Yovani Gallardo. Rickie Weeks could be a player that the Brewers would be willing to part ways with, but with his performance so far this season I doubt that any team would be interested in trading for him unless he really starts hitting. Corey Hart is a common name that keeps coming up, but at this point, nobody really knows if he will even be on his rehab assignment before the trade deadline. His injury has kept him out longer than expected, and the Brewers don’t think that he will be ready to play before the All Star Break. This will drastically diminish his trade value and probably discourage teams from wanting to trade for him. I also think there’s a big possibility that the Brewers try and bring him back on a one year deal for 2014. So, if the Brewers end up trading some or all of these players, that means that they are going to be going into rebuild mode, and there could be a handful of rookie debuts next year. Here is how I think the 2014 roster will shape up. Left Field – Ryan Braun. There is zero chance that the Brewers trade him and barring any sudden developments in a situation that I won’t mention, he will be the Brewers starting left fielder on opening day 2014. Center Field – Carlos Gomez. Another player who isn’t going anywhere. Gomez just received an extension before the season started and has performed better than anyone could have possibly imagined this year – it’s almost like he resurrected his career right before our eyes. (Hey, so this is what it feels like to be a Cardinals fan). It’s a treat to watch him play defense, and his speed on the bags makes him one of the best base runners in the game. Right Field – Logan Schafer. He’s shown the Brewers what he is capable of doing on the field this year – offensive and defensively. He has one of the Brewers’ best defensive plays of the year this year, gunning down Miguel Montero at home plate from left field in early April. His throwing arm is a thing of beauty, and he has been on fire at the plate lately. If Nori Aoki gets traded, I think Schafer will become the everyday right fielder. Honestly, this is a better option at third base than Yuni B. Third Base – This one is more of a question mark, but the Brewers have a couple of possibilities should they trade Aramis Ramirez. They have Taylor Green, who is currently out for this season with a hip injury. Jeff Bianchi, who is being used as a utility man for the Brewers right now, has the ability to play third base. The Brewers also have Juan Francisco, who is currently sharing time at first base with Yuniesky Betancourt, but is a natural third baseman. They could also allow Josh Prince some playing time. He was with the team earlier this year and is currently batting .255 with an OBP of .349 in Nashville. I don’t think any of these guys are long term solutions, but for a team who is attempting to rebuild, any of them would be an okay fit for a year. As long as I don’t have to watch Yuniesky Betancourt ever play third base again, I’ll be happy. Shortstop – Jean Segura. If you could give someone a negative chance of being traded, I would give that to him. Acquired in the Zack Greinke deal last year, Segura has become a hitting machine. He also has incredible range at shortstop and a very strong throwing arm. He’ll be here for awhile, folks. Second base – I believe that Rickie Weeks will eventually get himself out of his hitting slump and start playing every day for the Brewers. He has started hitting lately, but is still in a platoon with Scooter Gennett. Weeks will be owed $12MM in 2014. I don’t know about you, but I don’t want a player who is earning $12MM (the second highest 2014 salary behind Aramis’ $16MM) to be sitting on the bench half of the time. The Brewers aren’t going anywhere this year, so I’m not sure why they aren’t giving Weeks more opportunities now that he is finally starting to turn it around. First base – Many people are saying that Hunter Morris will be called up to start at first base in 2014, but I have a feeling that Corey Hart will be back. Since his injury will have kept him out for at least half of the season, teams will probably be hesitant to give him a big deal. The Brewers could bring him back for one year and help him build up some value. If things go well for him and the Brewers aren’t in the race again next year, they could always trade him before the deadline (assuming his stays healthy). Catcher – Either Jonathan Lucroy or Martin Maldonado will be the Brewers’ primary catcher in 2014. I seriously doubt that Lucroy gets traded, but if he does, we will probably see Maldy pick up most of the catching duties. So, as you can see, the Brewers offense will still be in pretty good shape next year. This “rebuild” will probably only take two or three years and the Brewers will be able to start contending for a postseason spot around 2015. And hopefully, by this time, the Cardinals, Reds, and Pirates won’t be the three best teams in the National League. But, for now, we’re just going to have to try and survive the rest of the 2013 season by making clever jokes about how bad the team is in order to make ourselves laugh so we don’t cry. They don't play Weeks because he has an option that triggers with plate appearances and he's not very good at baseball. It boggles my mind that he still hasn't learned the basics of defense and struggles with so many throws. Corey Hart is as good as gone at the end of this season, in my opinion. He's making roughly $10.3 million this season, and that's money the Brewers are probably going to want to save as Kyle Lohse, Aramis Ramirez, Yovanni Gallardo are due big raises next season. The Brewers have options at first base not named Corey Hart (Hunter Morris, Mat Gamel, Taylor Green, Juan Francisco), and there's no way to know what Corey Hart will have left in the tank coming off his injury. Hart is a free agent next year and I honestly seeing Hart getting the qualifying offer. Unless Morris shows he's 100% ready for next year, I think he's another year away. If Hart turns down the qualifying offer and becomes a free agent, at least the Brewers will get a aft pick for him. Why would Aoki not be back? My understanding is he has an option year that is very cheap for his talent.Schafer is a nice 4th Ofer but I dont see him being an every day OFer on a contender. Brewers should be playing Weeks more because Gennett is over rated player is not worth wasting our time with. Weeks needs to play for his value and an offseason trade. Well, as Kristin states in the article, its only if Aoki is traded at the deadline.